Do you know about WTC 7 ? It was the third building to come down on 9/11/01. Yes, the one that came down in 6 seconds, in free fall acceleration, as if in controlled demolition. 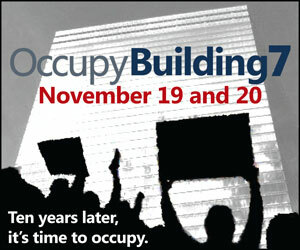 Since obviously the government has been lying to us for decades, does not work for us anymore, and has been deaf to our request to open a new independent investigation, we are occupying WTC 7 on November 19 & 20 to demand a new investigation, and we are inviting everyone who cares for justice and wants to join us. The time is ripe to occupy. And we need to clean house. Thanks for your help, no matter how small.